In search of a seat! Years ago, whilst living for a while in a small flat in Highgate I had intended to make enquiries as to the validity of my Aunties claim that a bench with my Grandfathers name on it was situated somewhere on the Kenwood Estate in recognition of the large donation of money he had donated to "Save Kenwood for the Nation" some years before his wool factories were seized in Poland and he was relieved of his wealth. I didnt know who I should contact and never managed to get round to it. A couple of weeks ago, whilst leafing through a magazine, I came across a number to call for information on walks around the Kenwood grounds and thus got swiftly & directly in touch with Matt Baker at the Kenwood Estate office. Matt seemed extremely interested not only in my enquiry regarding the bench, which, unfortunately has not yet been found (It is quite possible that the original has by now perished as it is over 70 years since my grandfather came in contact with the KenWood Preservation Society) but also asked if I would like to write a few words for the Kenwood magazine on the subject. Sadly for me, I never met my grandfather. William Whittingham died in 1939, several years before I was born. I have never heard a negative word about him, and have gained the impression from my father and other relatives, that he was a kindly, and hardworking family man, adored by my grandmother, Henrietta, daughter Grace and three sons of which my father Jack was the middle one. My cousin Digby, who had been strictly brought up by his father who was in the Army in India, remembers the exhilaration of being gently chided with a smile by Henrietta on the red-geranium lined steps of 42 York Place, for going outside onto the stray  "the both of them in their bedroom slippers!" It states somewhere that the gift was given to the Nation because he had been too old and all three sons too young to fight in the first world war. All three however, were just the right age for the next war in which the youngest, Derek flew Hurricane's in the Battle of Britain and also took part in the very fierce defence of Malta. In 1922 an appeal was launched to save 100 acres of the Kenwood estate for the public. It was about to be sold and built on. My Grandfather William Whittingham gave the largest donation to the appeal. 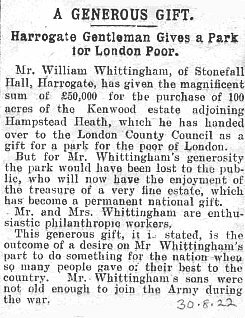 In July 1922 he presented a cheque of £50.000 to the council as a gift for a park for the poor of London. According to an article in the Times dated October 22 1922, this gift has happily decided the fate of Kenwood which would otherwise have been sold and built on. Grandpa Whittingham was hoping for a title which was not forthcoming. According to my cousin Digby, his Mother Grace said that he turned one down. We shall never know now which was the true story. However, I shall continue to look for his "seat" in the lovely Kenwood grounds, and even if it is not to be found, this search has been most rewarding.